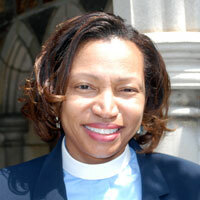 [Episcopal Diocese of Maryland] The Rev. Angela F. Shepherd, canon for mission in the Episcopal Diocese of Maryland, will be the new rector of St. Bartholomew’s Episcopal Church, Atlanta. “My season in Maryland has come to an end. Forever in my heart will be a special place for the people of St. Philip’s, Annapolis, who called me to be their Rector at the turn of the century. From then until now, working with others to bring God’s peace, hope, and love to the world has been a priority,” Shepherd said. Since 2010 she’s been canon for mission on the bishop’s staff and prior to that, rector at St. Philip’s for 11 years. Shepherd has served on many commissions, committees and boards of ministries in the Diocese of Maryland, including diocesan chaplain to the Daughters of the King. In the wider Episcopal Church she’s a member of the Executive Council Committee on Racism and the Disciplinary Board for Bishops. Since 2013 she has been a trustee of the Chesapeake Bay Trust. Shepherd is a graduate of the former Seabury-Western Theological Seminary, Evanston, IL receiving a master of divinity degree in 1996. She earned a doctor of ministry degree from McCormick Theological Seminary, Chicago 2014. In 2016 she received an Executive Certificate in Religious Fundraising from Indiana University, Lilly Family School of Philanthropy. Shepherd begins her new ministry March 1.